A collection of the geekiest tattoos in the world! I started using Ubuntu about 4 years ago, and it’s what really got me interested in open-source software. Now I work in tech and still use Ubuntu as my primary work-from-home distro in a Mac-centric office. I know the Linux fanboys will make fun of me for this (they seem to think that Linux is only cool if it’s difficult to use), but I’m pretty stoked on it. I got this at Action Tattoo in Orange County, CA, by the awesome and totally personable Will (who has been dying to do a zombie hand tattoo… might have to think about it for my next one). Posted in Computers, Logos, Tattoos. 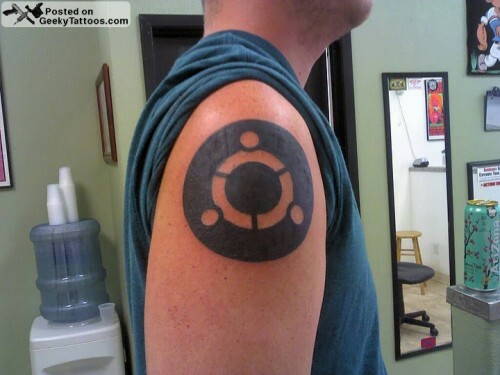 Tagged with Action Tattoo, linux, shoulder, Ubuntu. Geeky Tattoos is a collection of geeky tattoos that we’ve found here and there. If you’ve got an exceptionally geeky tattoo, submit it to us at submit@geekytattoos.com with a little bit of explanation (or just the picture if you want). The site is run almost entirely by Ed Hunsinger (aka @edrabbit), a body modification enthusiast and web geek out of San Francisco. cyrusam on Design Her Tattoo! cathycorn on Design Her Tattoo! Suggested Browsing on Who Is Atlas? danielaj on Design Her Tattoo! Triple Tattoo for Triforce Tuesday!